While Annabelle was by no means one of the biggest movies of 2014, it was one of the biggest money makers, pulling in $84.2 million domestically off a $6.5 million budget. It went onto make a staggering $256.8 million worldwide for Blumhouse Productions. So, of course news of a sequel shouldn't be too surprising. What is surprising is that it took this long for Warner Bros. and New Line to move forward on a follow-up. Writer of the original Annabelle, Gary Dauberman will be back to script Annabelle 2. This news comes just as James Wan begins shooting the sequel The Conjuring: The Enfield Poltergeist. Annabelle was actually a spinoff of the 2013 horror hit The Conjuring, and centered on the creepy Annabelle doll that was prominently featured in that movie. Annabelle, while having strong ties to The Conjuring's ghost busting duo The Warrens, has become its own thing, and is certainly able to anchor a second franchise. Annabelle 2 is currently in active development. Though it isn't known when it may shoot. 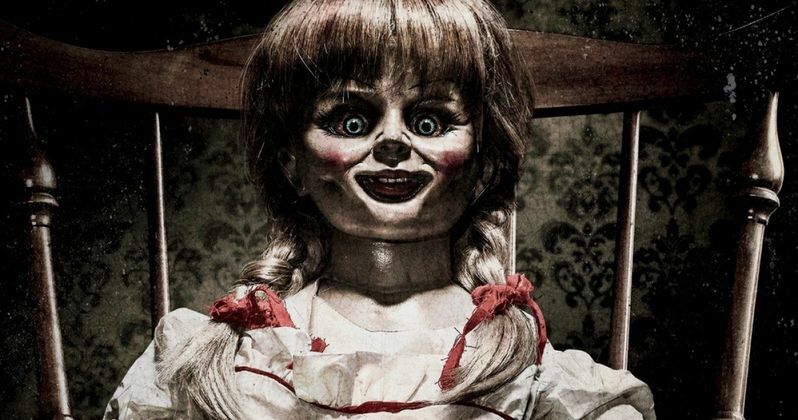 John Leonetti directed the first movie, but it is not known if he will return to helm this second installment of the series, which will mark the third big screen appearance of Annabelle. Sources close to The Tracking Board say that it's likely he'll turn down the gig. In that case, the search will begin for a burgeoning auteur to come in and take over the franchise. Original The Conjuring director James Wan will once again produce. He will be working closely with Dave Neustadter and Walter Hamada, who are overseeing the sequel for New Line. No plot details have been revealed at this time, and it isn't known who may star in this new story. The first installment was headlined by Annabelle Wallace, Ward Horton, Alfre Woodard, Michelle Romano, Eric Ladin, Paige Diaz and the incredible Tony Amendola. Annabelle is based on the true story of a Raggedy Ann doll that was possessed. The movie told the doll's origin tale, with The Conjuring showcasing the creepy child's toy as part of Ed and Lorain Warren's collection of supernatural artifacts. The spinoff movie focused on a young couple who discover that their vintage doll is the host of a malevolent entity who arrives after a satanic cult ransacks their home. Annabelle was Gary Dauberman's first feature film as a writer. He soon went onto write Crawlspace for director Phil Claydon and New Line. He is also re-teaming with John Leonetti and New Line for the home invasion thriller The Wolves at the Door. Next, he'll pen the CBS Halloween horror movie Hellfest for acclaimed genre director Neil Marshall. So, are you excited to see the possessed doll return in Annabelle 2?